For many illustrators just starting out, making the decisions about how to direct their careers can be a daunting and even confusing task, but a necessary one. Most illustrators believe that the type of work they produce, it’s style, subject matter, genre, etc. will automatically take them to wherever it is they wish to go in their career, and they a partially right. In some cases illustrators are fortunate enough to be discovered or to fall into a focused career path, but many new illustrators don’t know where they want to go, or even the kinds of directions an illustration career can take for it takes a fair amount of research and some contemplation to determine career aspirations. One problem is that new illustrators quite often don’t even know where to begin, and career path guidance and information has had its shortcomings in illustration education and the field at large. Articles titled “How to be an Illustrator” simply don’t cut it any more than they would if the title was “How to be an Industrial Designer” for illustration is much more than simply being able to draw or paint well it is a distinct and technical career in the visual communications field that involves a number of business and non-visual communications skills. Despite what some may think, in addition to providing an artistic education, colleges and universities do provide education in these other areas. To begin, let’s assume that they have artistic training and possess the formal body of artistic knowledge and the ability to professionally execute illustrations. To compliment this, they must also have been educated in methodology used solve illustration problems. For these most basic skills are the foundation on which an illustration career is built. Without the exposure to dynamic methods and resources that impart and encourage these qualifications, a career in illustration will be very difficult to achieve. Self-awareness of the qualities and skills that it will take to support a career in illustration is a necessity. This is then combined with knowledge of the illustration field, the scope of media and styles it supports, the markets it encompasses, the clients it serves, the audiences it benefits, the types of assignments it contains, etc. This is essential for an illustrator to determine his or her place in the illustration business, and having that understanding is necessary to formulate a career strategy. 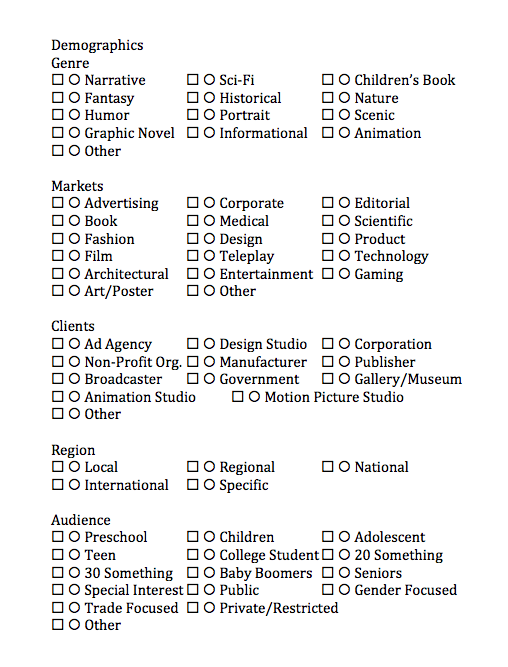 The checklist below is provided to help an illustrator recognize, describe, and classify their work. It is divided into media, style, demographics and assignments. 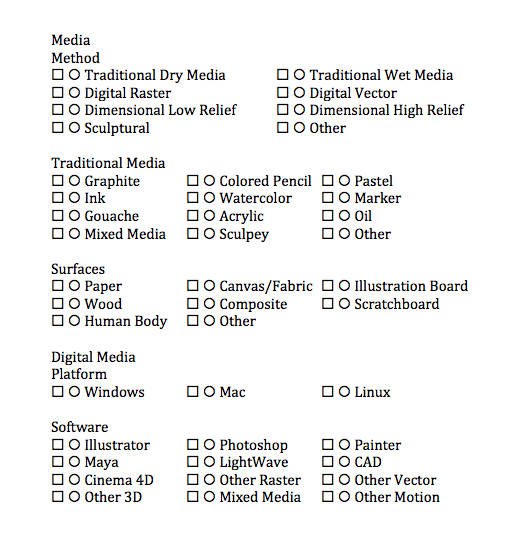 The list can even be used to identify possible directions an illustrator could pursue in their career. 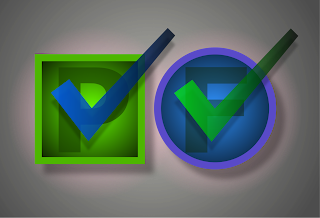 Place a checkmark in the squares to identify all the traits that pertain to your work at the present time. Then place a checkmark in the circles next to all the traits that represent career aspirations. If you wish to continue a certain trait that applies now also in the future then check both. By comparing what you have achieved in the present to what you may wish to achieve in the future, you can get an idea about which directions to pursue with your work.